Choosing the correct battery is important, because moving 5 servos has a real power consumption. Servos are motors and motors consume a lot of energy. 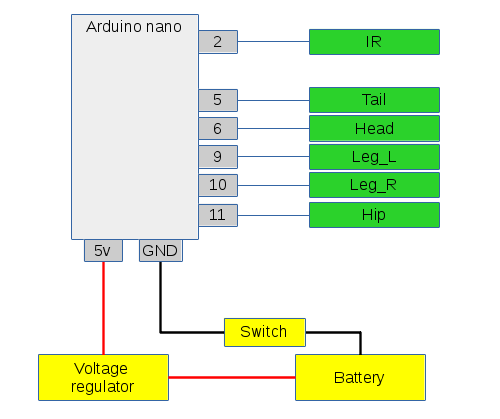 The problem is that when a system requires more energy than the battery can serve (Amperage of discharging) the voltage drops belong 5 volts that requires Arduino (specs) and Ardunio resets itself. So, it is needed to maintain 5 volts constantly. A 9volts alkaline battery + voltage regulator : It works fine and it fits inside the body of the toy. However, when the power is over, it is necessary to extract the entire battery to replace it. A 2S battery (2000mAh) + voltage regulator: It works fine but is too big. However you can leave the charger cable outside the body of the robot to charge it.